PHP if not the best is one of the best career options for developers to consider. Search top jobs sites, and you will find more PHP openings than any other competing technologies. The results are the same on freelancing sites as well. Even after so many new upcoming fast growing web technologies, there is no slowdown in the growth of PHP. 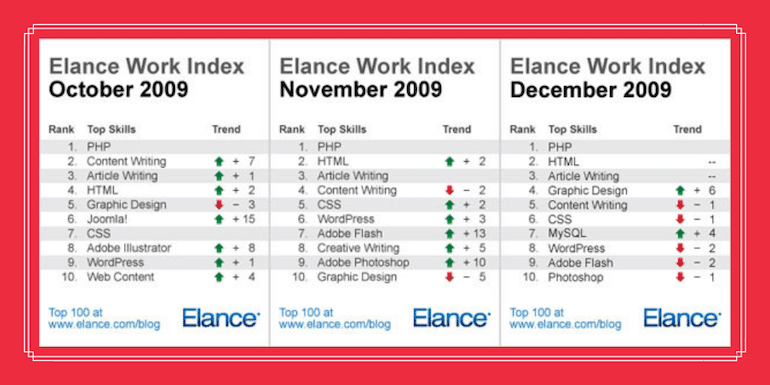 PHP was the hottest skills in 2009 on Elance Work Index. And continues to dominate and grow in the competitive landscape of the web programming world even after a decade. 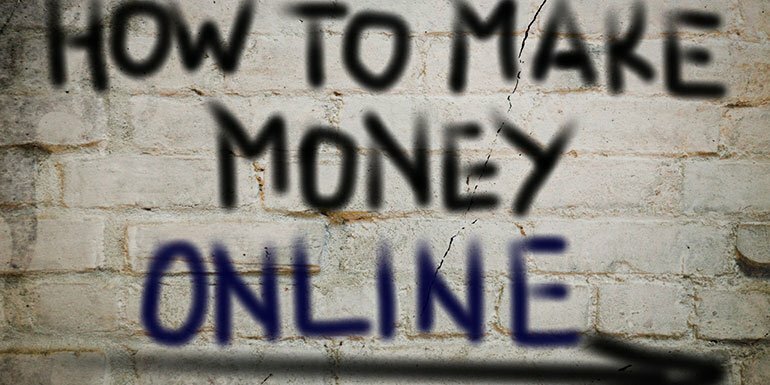 So here are some of the key ways to make money with PHP programming. WordPress recently crossed the mark of powering 33% of the top websites. It increased from 30% a few years back. Only one CMS powering 33% of all sites is too much. WordPress is in PHP. So PHP is also increasing its foothold on the web along with WordPress. As a developer, one shouldn’t ignore PHP. If you are into any other programming language, there is scope to be a PHP developer. Try working your way into the basics of PHP on weekends and work out a plan to get into a job in PHP. Again the salary may take a step backward when you move from being an experienced in some technology to a fresher in PHP, but it will be a good step in your career for sure. There are many great CMS in PHP. Needless to mention WordPress. But there is life beyond WordPress as well. CMSes like Drupal, Joomla, XenForo, OpenCart, etc. choose one and add some extra functionality into the CMS with a plugin. One can directly sell these plugins or offer as freemium where a limited functionally is free and pay for more. One can also provide the complete plugin as free to demonstrate the expertise and create a sample for client works. If you aren’t into development but a designer, develop themes for the CMS. Offer it as premium or offer them as free and charge for customization. The option to provide a free version as a sample for freelancing client work is also open. PHP is not only limited to CMSes, but there are many great PHP frameworks as well. Choose any PHP framework and build some scripts for it. Depending on its usability offer it as free, freemium or premium. If you are working in PHP, or even trying to learn PHP, I am sure many others will wish to embark with you on the journey of learning PHP. Share your journey of being a PHP developer on a blog or share your experience in PHP. I know there are already many PHP blogs available, but there isn’t anyone like you. Find your unique way of letting people follow what you are learning. Here is my step by step guide to set up a blog in WordPress. One can start a local coaching institute or even shooting the complete course and sell it on Udemy. If you aren’t sure about selling a course as yet, release a few short videos on YouTube to see how they perform. I know there are tutorials available, but the Internet will always welcome your style of teaching your student. Working on online freelancing sites like Upwork can help you make money working in PHP. In a strict sense, I have been doing PHP development, but then I generally work in CMSes like vBulletin, XenForo and WordPress only and not directly in Raw PHP or PHP Frameworks. One can consider going via a PHP CMS, PHP Framework or direct raw PHP. There is scope for everybody. Just remember the more niche you choose to be, the lesser competitive it will be. Everyone can be a PHP developer, but there are few XenForo or OpenCart Expert. Here is my complete guide for you to get started on Upwork or finding clients and getting paid better. Options are limitless for developers. One can develop a unique kind of website in PHP. Just for the sake of giving examples, here are some of them. Job sites for employers to share openings. Anything that you find useful and not already available is a good point to start. Last but by no means the least is to participate in code contest to win a cash prize. Yes, it is tough to find contests regularly but if you win a contest, it can help you in many ways in your job, as a freelancer, as a blog. Look for PHP Contests on Google and I am sure you will find some contest worth participating. Apart from an online competition, consider being a member of the local PHP developer groups in your locality. Participate in Google Summer of Code. It is still open and one can do it from the comfort of your home. Shabbir, what about in 2012, which is your preferred site at present? These reviews will help you understand how these sites work. Nicole says that you can call in and talk to a facilitator 7 days a week… I have to disagree. I have tried to call in numerous times and not been able to reach anyone. Additionally, if you decide to work through vWorker (Rent A Coder's new name), don't be in a hurry to get paid. Their pay periods end on the 15th and the end of the month and then they have 7 days to get your money to you. So, lets say you finish a project on the 1st of the month. That project will go on the pay period ending the 15th. And then it very well may be the 22nd before you get paid. So, almost a month has passed since you finished the project. Additionally, when getting paid, even though vWorker has already charged you 15% of the amount that you bid on the project, they still will charge you 2.00 more to process the money for you. During these possible 21 days, where has your money been? My guess would be in vWorker's bank account drawing interest that you will never see. Yes that is a very good point and Elance does offer on demand payment anytime during the month. Hi Shabbir. I unfortunately cannot locate their Expert Guarantee on the site (today) so I'll just assume they don't currently offer it. Until then, I'll encourage those who find the Expert Guarantee invaluable to take full advantage of it through vWorker. Thank you for giving me a platform to speak. Great point that vWorker is a good place to start. It is after all, where I got my start in freelancing and I haven't looked back since. Many others like myself have chosen to stay with the service, as it offers the best protections in the industry — in particular with the arbitration service. I am glad that vWorker's arbitration service is available at vWorker at my disposal, and I'm glad that it's completed quickly without fear of additional costs. As far as users creating multiple accounts, these types of situations seem to make themselves known without much effort. People get sloppy in their attempt to deceive and they inadvertently trigger a red flag prompting due investigation. Of course, we cannot disclose the things that trigger investigations since it would encourage dishonest persons to try and cheat the system. Our goal at vWorker is to keep it a safe working environment for all. But I have not seen the Expert Guarantee program offered on other services. If you would point out where else it is available, I will greatly appreciate it. Hi, this is Nicole from Rent a Coder. Rentacoder provides access to programming, writing, illustration, even php jobs. (You can get a sense of the broad scope of work available here: http://www.rentacoder.com/RentACoder/SoftwareCo…). I'd like to point out a few differences between our service and Elance since those differences could influence your satisfaction and earnings. The more a site charges you, the less you have to put in your own pocket at paycheck time. Unlike Elance, Rent A Coder does not charge you a monthly subscription fee for any bidding or certification privileges. Workers on Elance cannot place more than 10 bids a month unless they pay a subscription fee ($10/month for 25, $20/month for 40 or $40/month for 60). They also cannot be certified in over 5 areas without paying the same fee. Rent A Coder does not charge any subscription fees. The cheapest and easiest way to work with a buyer is to bill by the hour (called pay-for-time). However, a new buyer doesn't know yet that you're productive, and won't run up a huge bill with fluff hours. To help you establish that trust, both Elance and Rent A Coder let you work with them safely by bidding a fixed price for the final deliverables (called pay-for-deliverables). However, Elance's extra charges for arbitration may make it prohibitively expensive to exercise your rights. If a buyer doesn't pay you for work you've properly delivered, both sites will step in and give you the funds via arbitration. However Rent A Coder does this for free. If a buyer doesn't pay you for work you've properly delivered, both sites will step in and give you the funds via arbitration. However Elance charges you $66-$133 to do this. This may also make it impractical to get paid on smaller projects. Rent A Coder, on the other hand, does this for free. On Rent A Coder you can start arbitration immediately. A buyer intent on abusing the system can stall the start of arbitration on Elance for 21 business days and during this period your money is not available to you. During the first phase (dispute assistance), the buyer has up to 3 business days to respond, and can make this phase last up to 12 additional business days (15 business days total). After this, the arbitration phase 'begins', but does actually start because the buyer is given 3 business days to acknowledge the notice of arbitration, and the another 3 business days if they did not acknowledge the first notice. Only at this point is arbitration actually started. See the Elance contract for more information. Once a buyer trusts that you won't bill them for unproductive hours, you can bill them by the hour (called pay-for-time). This has many advantages over pay-for-deliverables including cheaper fees, flexibility (you don't have to define all the requirements in advance to start working) and less risk (under-estimates are no longer your responsibility to bear). However Rent A Coder guarantees payment, while Elance does not. Rent A Coder guarantees payment for every hour you properly record in the AccuTimeCard. It also requires the buyer to escrow the funds for the week in advance to make sure they are good for the money. If they try to withhold payment unfairly, Rent A Coder will award you the funds. Elance does not force the buyer to escrow funds on pay-for-time projects. As a result, it does not guarantee payment, and you may do the work and receive less than you agree (or nothing at all). Rent A Coder does guarantee payment. If you have any questions, please let me know. You can also call in to talk to a facilitator 7 days a week, or email us (see http://www.rentacoder.com/RentACoder/misc/Feedb…). Talking about RentACoder I see lot of issues you have and normally I do not prefer to disclose them but as you have referred points I will make sure I clarify all of them and prove how Elance is 100 times better than RentACoder. First I have a RAC profile with hardly few 100 dollars and my elance profile is close to 10k USD now and that does speak for itself. Now coming to your each point. Cost. RAC charges 15% where as elance charges 8.75% of the project fees. Elance charges per month for bidding and this means all students who are ready to clone RentACoder for $50 moves out. Many a times we may need to work before the escrow but RAC terms do not allow this Which means we need to know the final product too well to bid and that is only possible for homework help. About Guaranteed Payments I do not see Elance lack anything. You are giving wrong information. Elance get both the parties on a con call and then if they still cannot agree on a common terms of arbitrage ( which is most unlikely ) they appoint a third party to do more investigation. Now I will tell you many issues with RAC which if you think you are good can let me know. 1. Your Minimum bid is $4 where as you charge $3 and Elance minimum bid is $50 and so do you still think people will make more with RAC or elance. 2. Elance has categories and where you need to be an expert and ready to subscribe but with RAC I can bid for anything without any check if I know and this means a buyer need to work out hundreds of unwanted bids. I also tried buying in RAC but I could not get myself anything after 3 times and was tired of the things. I will add to your list of issues with RAC and that is you cannot ask for partial payments and this means you cannot break a project in parts and work on completing each milestone. Any realtime project cannot be done without stages. Yes this is one more issue. Thanks for pointing it out. Hello again, Shabbir. Nicole mentioned this earlier, but I just want to clarify for you and codeunlock: You can use milestone payments on vWorker. vWorker encourages this practice, and setting up milestones and receiving partial payments are fully integrated into the site. If you already became aware of that, then I apologize for repeating it. Thanks again for the open dialog and for being a long-time user at vWorker. Hi Shabbir and codeunlock. I will respond to both of your comments here. 1. Your income at elance may be satisfactory for you and for that I am glad, however some of our workers make tens of thousands of dollars a year and more (see the worker list ranking list at https://www.rentacoder.com/RentACoder/misc/AllC… for details). 2. When you compare RAC's fees to Elance's fees + monthly subscription fees, and arbitration charges (Elance charges $66.66 or $133.33 for each arbitration where we provide it for free), you'll see that RAC is the clearly cheaper option. 4. We do not permit our coders to work before we secure escrow payments in order to protect them from buyers who may run away with a completed job or partly completed job before paying coders what they're rightfully due. We also encourage use of the bulletin board before escrowing so that a buyer and a coder can engage in full conversation and ensure that a job can be completed pre-contract. If a coder is not 100% sure that he or she can complete a job to a buyer's satisfaction, then that coder should not bid on it. 5. One significant difference between RAC and Elance is that we do not charge for arbitration. Elance's 3rd party arbitration system could cost you $66-$133, but what if the job you're working on is a small, simple job that costs less than Elance's fee $66-$133? Would you be willing to just give up getting paid simply because Elance wants to charge you more than what the job is worth? Every coder I know would not be willing to sacrifice getting paid even if the job was a simple $75 job. 6. It is extremely rare that a person posts a $4 dollar job — even rarer that someone bids on a $4 dollar job, Shabbir. Knowing our fee structure, it makes perfect sense to seek out and bid on much higher paying jobs such as our jobs that pay out over five or ten thousand dollars minimum. 7. We have many helpful tools that can help buyers hire a competent worker. Some of those tools are our ExpertRating program, our Expert Guarantee program, our Ratings and Feedback system, and more. Other supportive tools include a money-back guarantee, a completely free arbitration process on all types of projects, and a seven-day-a-week phone support system. I am glad to see that you've remained with us, that you have a good rating, and that you have completed 41 jobs. I encourage you to continue the success you've had with us, as I see you have impressed several of the site's clients who more than likely depend on your expertise. Codeunlock, working per milestone and getting paid per milestone is certainly do-able at Rentacoder. This is something that you and your buyer can work out on the site's contract. If you prefer working per milestone, make this preference clear in your conversation and get a buyer to agree to it. Buyers have the option to release different percentages of escrowed funds, so you may certainly ask a buyer to release a percentage after you've completed an agreed upon milestone. Point :1 That is true for any Freelancing Site that people make 10k per year but the point is is how much you get paid per hour. In RAC there are hundreds of projects posted just for homework help and this are not projects and I am sure you would agree on it. Point 3. I meant is there are too many people who are willing to bid on your project at price which is un-imaginable and you end up as bad quality product as a buyer or as a coder you as a quality coder loose potential clients for all those people who have no idea about the actual pricing and quality. Point 4: You mentioned coder should not bid for it but then there is no way to force this. Elance does that with connects and so you get serious bids only. Again there is no way in RAC for user to keep using an account. You get bad rating in your 3rd / 4th job and you can get a new account. No verified credentials apart from email. Point 5 : In RAC the rate at which you end up in Arbitrage is much much higher than Elance. I have not seen Elance arbitrage for almost 20k USD earnings I have done in and outside elance. Point 6: Yes I know about jobs that pay high but point is about homework help jobs which many people for a rating or two get it done for $4 and then using that rating build on the profile for couple more rating and once they get one bad one then go for a new account. Point 7: That is normal for any other site and all have some good tools and I agree RAC also have them. Now about my bidding on RAC goes I am not able to compete with those college students and so rate of award for me is very low. Yes I do not give up on freelancing but then it should be worth the price I put as an effort to write the complete bid. Hi Shabbir. Thank you for responding. I'll address your points in the same manner that you addressed mine to maintain consistency. Point 1: vWorker hosts jobs contracted at wide price ranges. Yes, some jobs are priced low, but others are priced at $50,000 and more (enterprise business projects are priced at $50,000(USD) and above). You can bid on jobs of your prefered price range by customizing the site to filter out Projects that you aren't interested in. Projects that don't meet your filters will not show up on the site, nor in your daily newsletter (if you've chosen to receive it). Point 2: I believe you're addressing 'arbitration,' rather than 'arbitrage,' so I'll address that issue. I'm glad to hear you haven't been called into arbitration at Elance since arbitration at Elance requires a non-refundable fee (either $66 or $133.33). At vWorker, we test your deliverables at no cost to make sure they meet requirements and to ensure our workers are rightfully paid. This is a protection scheme that we're proud to offer and it's a protection scheme that many workers appreciate. Point 3: It's important to understand that although the amount paid for work may be small to you, that same amount is often much larger to the Worker who receives it, and therefore, doesn't necessarily indicate poor quality work. $100 to you could be $1,000 to a foreign Worker who is subsequently certainly willing to do a good job for it. Point 4: Shabbir, multiple accounts are not allowed at vWorker, so I'm not quite sure how to address this point. Point 5: I would like to see some statistics that support your claim on this one before I comment on it. I'm sure you're speaking from a personal experience — but what may be true for you may not be true for someone else. Point 6: Again, multiple accounts are not allowed at vWorker. If you're aware of coders creating more than one account, please report it to us, as they are violating our terms of service. Point 7: Shabbir, vWorker is the only service that offers all of the tools we offer in a single package. vWorker is also the only service that offers an Expert Guarantee program. I am encouraged to hear you will continue your freelancing efforts. Many workers have found unparalled success at our site by taking advantage of some of the exclusive tools and services we provide. I want to stress that what may be true for you may not be true for someone else, and that perhaps, is the most important issue that this conversation has brought to light. Just to make things positive I think I have already reviewed vWorker and it is now one of those programs which I tend not to use but there is nothing against it. Now regarding some of your points. Point 1 : I agree on job range but then majority of them are in low range job but I guess it is good for many to start with as well. Point 2 : Arbitration. I have not landed on any arbitration does not mean I have not involved in anything related and I know about the fees but that is when there is any legal activity needed. Elance first contacts both the party and arranges a conference call with Elance representative as mediator and if buyer and seller agrees on common terms the arbitration closes without any charges but if they cannot come to common terms it goes to third party for legal confrontation and this is when the fees come into picture. Point 4: Say if I have 2 accounts how would you know. I am not using them parallely but when one of them had some bad rating I opened a fresh account. Point 5: Yes my personal experience. See my last few job as buyer and you would see what I mean. Point 6: The question is how would you or I know it. Point 7: Expert Guarantee program is provided by many other sites as well and not only on vworker.